It’s lunch Jim, but not as we know it! Introducing Black and Blum’s Box Appetit Bento Box, the totally unique, totally ingenious and totally awesome lunch box that’s going to change your lunch break for good. Gone are the plain rectangular boxes of your childhood…this little baby has had an upgrade – Japanese style. Inspired by the Japanese tradition of bento – or beautifully presented, single-serve meals, the Box Appetit Bento Box allows you to prepare a gorgeous meal that will have your workmates eyeing you jealously on your next lunch break. Made from BPA-free plastic, the box features a glass-like lid that locks on top of the box with two clips to create a watertight seal. Turn the lid over when you start lunch, and it becomes a tray, complete with a sauce dipping area. Inside, the box features a little sauce pot for things like relishes and salad dressing (now you can dress your salad right before you eat it!) as well as a handy divider, so you can keep two different foods separate. A fork fits into a rubber holder on the lid, so it’s always there when you need it. The Box Appetit Bento Box is so cute – and so clever! With this adorable lunch box, you’ll look forward to your lunch break all day. Made from polypropylene and co-polyester plastic. 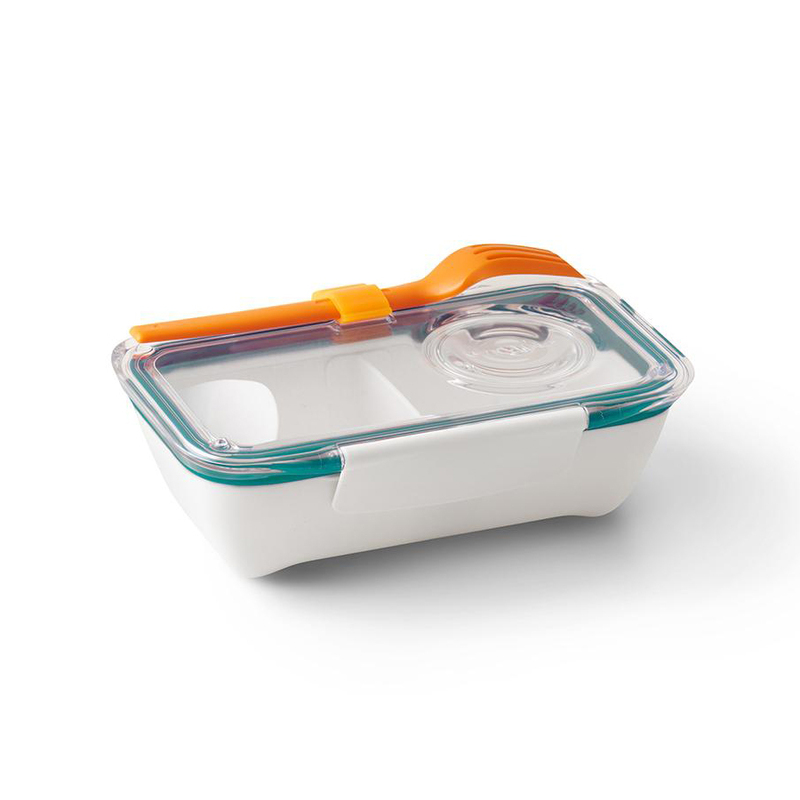 Glass-like clear lid locks to the base with side clips for a watertight seal. Flip lid over to use as a tray – it features a special sauce dipping area too! Includes a sauce pot, ideal for salad dressings and relishes, so you can dress your meal just before you eat it. Includes a removable, sliding divider, so you can fill your Bento Box with two completely different types of food. Fork features a sharpened edge that acts like a knife. Fork slides into a rubber loop on the side of the Bento Box when not in use. Dimensions: 19cm (l) x 6cm (h) x 12cm (w) (Including Lid).